Which basses do you seem to come back to? Re: Which basses do you seem to come back to? I float quite a bit, although there's a couple of staples I seem to keep coming back to. One is my old '64 P Bass that I run with a '69 Jazz neck; it's referred to in this Household as my second wife, which kind of says it all! The other is my Yamaha BBN5A, which is the model they based the first Nathan East NE-1 on. Bought it new 18 years ago; I walked into a Shop to buy some strings, had a play of it, & it floored me! Walked out with it half an hour later (& forgot the strings I went there to buy in the first place! ). Funnily enough, on the strength of that Bass I actually bought an East NE-1 when one came up for sale S/H a few years ago; I was planning to use the NE-1 as a main Bass & de-fret the BBN5A. Ended up selling the NE-1; it sounded a bit different, & I actually preferred the BBN5A! After many years on P Basses, I have settled for the last year or two on Gibson Humbucker Basses (TBirds, LPs, ES 335 etc). They seem to work better to my ear with the guitarist's Strat. He recently bought a new Strat which is HSS (If only I could get him to buy a LP). We have gigs the next three weekends and I have been thinking about taking my 73 P Bass to one and give it a set to see what I think now with his new Strat. I took the 73 P out and gave it a set up yesterday. Three gig now done. Sound checked a different P bass and a Tbird each time and then put the P Basses back on the stand for the gigs. Dean Sledgehammer 5. 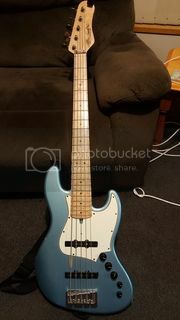 Possibly the cheapest bass I've purchased. Maple neck, swamp ash body, no name MM pickup. The only mod I've done was to put a DIY pre-Ernie Ball 2 band preamp in it. It just seems to do everything well. And I generally favour Ps. But it's just THAT good! BUT the one bass that I seem to come back to is the Yamaha BB. The BB400 was my first bass back on the late 70's (it only had a P pickup). So the BB1024X just feels like home, but does sound better than the original (to me anyway). It has more punch, better low end and top end and is more versatile with the PJ setup. The J pickup has a ceramic magnet and just sounds right IMO. It's a wonderful passive bass albeit on the heavy side at around 4.4kg. When it comes to 5 stringers it's definitely my Xotic Xj1T5. Versatility plus although I do prefer 4's. If I have to go for a 5 this is it for me. I keep going back to Yamaha BB's too. First one was a BB300 in the early 80s. I've had heaps of different basses over the years but BB's always just feel right to me. I keep going back to Fender American Jazz Bass Deluxe V Samarium Cobalt Noiseless. I sold two previously but regret it. I've got two now. 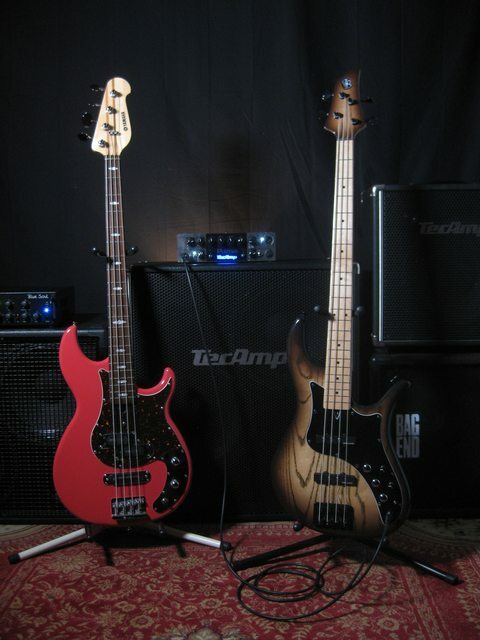 The orange one is my main bass. Exactly the same model but they sound a bit different. I suspect the body, alder v. ash. I prefer the alder (orange). Fender custom shop Reggie Hamilton PJ5 has been my main player for a decade. Not likely to change any time soon.